I made these cookies specifically to pair with Vin Santo wine, a semi-sweet to sweet Italian dessert wine. 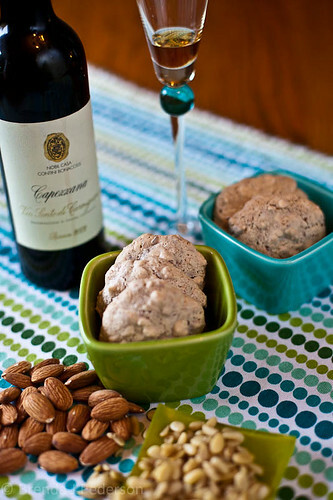 Biscotti is a more traditional pairing but I thought the nuttiness of Brutti ma Buoni would work well and it did. Brutti Ma Buoni (sometimes just called Brutti Buoni) means Ugly but Good in Italian. I’m not sure why, because they really aren’t that ugly. There are a lot of variations of this cookie: different nuts are used; flavorings can be added. The basic recipe is always the same though. The recipe I used was from the book, Adventures of an Italian Food Lover by Faith Heller Willinger. I received this book as a gift from the publisher a couple of years ago but this is the first time I’ve actually cooked from it. Similar to Biba’s Italy, the cookbook I used for the last couple recipes I posted, the recipes in this book are from Italian restaurants. The author talks a bit about the chef and the restaurant and then presents their recipe, however the ratio of background to recipe is much higher. Where Biba’s Italy has a short introductory paragraph before each recipe, Adventures of an Italian Food Lover generally has a page or more introduction and then the recipe. It’s a little more of a travel journal instead of just regional education. I’ve made several recipes from Biba’s Italy and the only changes I’ve made have been due to an ingredient I wanted to switch out or some other customization based on personal preference. I’ve been really pleased with everything I’ve tried. In this first recipe from Adventures of an Italian Food Lover, the instructions were not quite right, which I caught as I was making the cookies and was able to correct before I got too far into the recipe. Luckily this is a fairly popular cookie and so there are lots of recipes available for comparison. This will make me read the rest of the recipes with a more critical eye but I hope this was just a one-time slip. The cookies are really good – a little crispy on the outside, chewy on the inside with a great nutty taste. They went perfectly with the Vin Santo and equally well with tea. They come together pretty fast, so this would be a good recipe when you are short on time. As soon as you have them on the cookie sheet get the sheet into the oven, as they will really spread out if you leave them on the sheet too long before baking. Prepare cookie sheets by buttering and lightly flouring. Alternatively, use silicone baking sheets in your pans. Preheat oven to 350°F. Place almonds, pine nuts and 1/4 cup sugar in food processor. Process until the mixture looks like very coarse cornmeal with many small pieces of nut still visible. Beat egg whites until soft peaks form. Slowly beat in 1 cup of the sugar. Add the nut mixture to the egg whites to combine. Then mix in the flour. Using two spoons, place 2-inch “blobs” of batter on the prepared sheets leaving 1 inch between them. Bake for 12 – 15 minutes, until the cookies are just barely colored. (Bottoms will be more golden.) Cool for a few minutes on the baking sheet and then transfer to wire racks.